The Black Tortoise is ane o the Fower Seembols o the Cheenese constellations. It is whiles cried the Black Warrior o the North (北方玄武, Běi Fāng Xuán Wǔ), an is kent as Xuanwu in Cheenese, Genbu in Japanese, Hyeonmu in Korean an Huyền Vũ in Vietnamese. It represents the north an the winter saison. Awtho its name in Cheenese, Xuánwǔ, is aften translatit as Black Tortoise in Scots, it is uisually depictit as baith a tortoise an a snake, specifically wi the snake coilin aroond the tortoise. In auncient Cheenae, the tortoise an the snake wur thocht tae be spiritual creaturs seembolisin longevity. 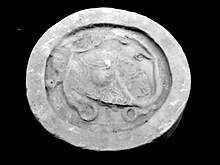 Durin the Han Dynasty, fowk aften wore jade pendants that wur in the shape o tortoises. Acause o auncient Cheenese influence on Japan, honorific titles an badges in Japan aften referred tae the tortoise or images o tortoises. Wikimedia Commons haes media relatit tae Black Tortoise. This page wis last eeditit on 1 Mairch 2018, at 00:18.